What is a Machine Shop? | Kosmo Machine, Inc. There is some confusion when the term ‘machine shop’ pops up; some people think it is where a machine is produced. However, that’s not true. 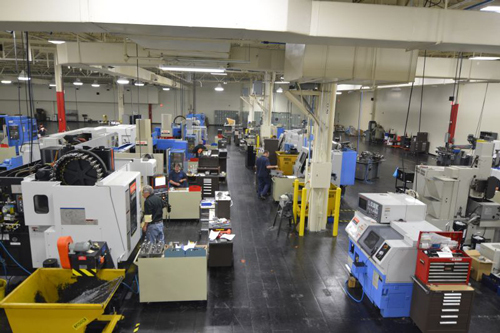 A machine shop is simply a place, location, building, company or room where machining is carried out. Machining refers to the cutting of raw materials in order to convert them to the desired size and shape. Machining is done on metallic parts as well as plastic, ceramic, wood, and various composites. A person who performs machining it is called a machinist. Different types of hand tools, cutting tools, power tools, and machine tools are used in a machine shop. It can be done as a hobby, business or both. A machine shop can be a separate shop or a part of a large factory where manufacturing takes place. The end product of a machine shop is a part which can be made of metal, plastic, wood, ceramic, etc. The parts are then sold to other manufacturing industries such as the automotive industry, aircraft industry, power generation industry, or shipbuilding industry. What does a Machine Shop Consists of? A machine shop typically consists of the following types of equipment for producing parts. Machine shops often also contain the raw materials required for manufacturing the specific part, such as bar stocks. It also stores an inventory of the parts that have been finished. Setting up a machine shop is not easy. It requires a lot of capital as most of the machinery is expensive. Secondly, it requires skilled workers, especially if you are running a shop that specializes in repairing the components of engines, for example. You might be imagining hundreds of workers laboriously working in a machine shop; well, the picture is somewhat accurate, but it doesn’t really hold true in modern times. Modern machine shops do not have masses of workers; many of the processes are automated and controlled by computers like robotics, microcontrollers, microprocessors, and PLCs. An example is the CNC machine commonly used in a machine shop. Before the Industrial Revolution of the 19th century, parts were manufactured in small cities, towns, and villages in local workshops. Then when factories began to spring up, most of the machines were constructed onsite. Before long, factories established their own machine shops. Up till the early part of the 20th century, machine shops were powered by mechanical belts driven by steam engines. Later, electric motors took over. With the development of electronics, machine shops became automated with the introduction of numerical control. As computer technology advanced, it was integrated with the machine tools used in a machine shop and eventually, computer-aided design and manufacturing became popular.